"You have eyes Huntsman, but you do not see"
Universal has unleashed their second full-length trailer to Snow White and the Huntsman. And despite the fact that Kristen (can't act/horribly cast) Stewart stars as Snow White, this trailer still looks phenomenal and I'll for sure be seeing this in theaters. 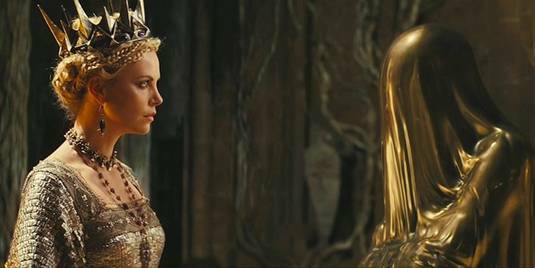 The movie also stars the likes of Chris Hemsworth as the "Huntsman" and Charlize Theron as the Evil Queen. This is even more epic than the first trailer, with even more stunning visuals, and awesome battle scenes. (side note: I do feel this trailer reveals too much, but whatevs) This is definitely a dark, Lord of the Rings-like twist on the classic fairytale. It looks badass. Take a look! In this new epic action-adventure Snow White and the Huntsman, Kristen Stewart plays the only person in the land fairer than the Evil Queen Ravenna (Theron) who's out to destroy her. But what the wicked ruler never imagined is that the young woman threatening her reign has been training in the art of war with a huntsman (Hemsworth) who was dispatched to kill her. Actors Eddie Izzard, Ray Winstone, Bob Hoskins, Toby Jones, Stephen Graham, Eddie Marsan and Ian McShane play the seven dwarfs. This is being directed by Rupert Sanders, an acclaimed commercials director making his feature debut. Arrives in theaters on June 1, 2012. I can't wait! As soon as I say that wanna be vampire chick is in it I switched off the trailer in disgust. Maybe it will be good but it's not for me. Did you know Schindler's List was based on a troo story??!?!?!?!? !